GenderFun.com: ​ Do People Believe You are FAKE? 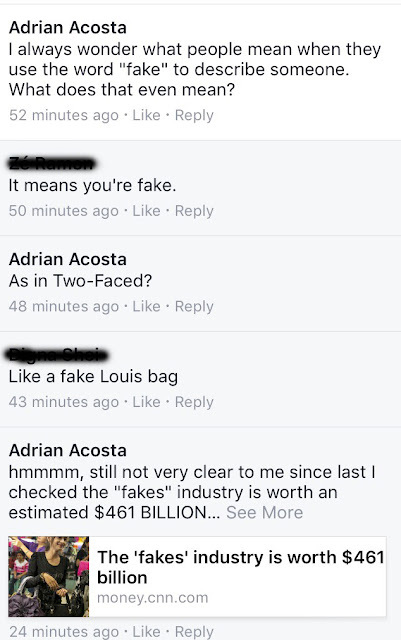 ​ Do People Believe You are FAKE? This December (2017) will mark 37 years since Mark David Chapman killed The Beatle's John Lennon for being a "phony." The convicted murderer chillingly once said ‘Lennon was a phony ...’ Mr Chapman borrowed the term "Phony" straight out of J.D. Salinger's 1951 popular novel The Catcher in the Rye. As a person, myself, who presents both in male and female form I've always found this term "phony" or "fake" interesting. I've even written a blog entry back in 2013 about this ridiculous and DANGEROUS notion that there is this thing we call a "true self" or an "authentic self." As if saying there is a REAL self and a FAKE self. Recently the actress Michelle Pfeiffer did and interview for Interview Magazine where she said "I have this constant fear that I'm a fraud and that I'm going to be found out. " And right after reading that interview we learned about the new documentary on the late singer Whitney Houston "Whitney Can I be Me" where Houston's saxophonist, Kirk Whalum, summed up Whitney's internal workings in a quote that became the title of the film. "Her favorite saying was, 'Can I be me?'" said Mr Whalum. Did Whitney feel like she was being a phony, a fake, not her "true self?" could be perceived as being "Fake"
by someone who doesn't dress? To think that there is a REAL self is a fallacy. Society is constantly judging us by our appearance. At the end of the day we are all REAL, like JLo. No matter how or what we present to the world. Keep being YOU as complex as it may seem to the world. can contribute to this world during your relatively short existence. they still don't "get you" then wish them well. You have a lot of Life to live and can't be bothered to have to "prove" yourself at every Life's turn.